You will most likely arrive at one of the two international airports that serve Paris. Roissy / Charles de Gaulle (CDG) is located 23km (16 miles) north-east of Paris, and the smaller Orly (ORY) airport is slightly closer to the city and located 13km (8 miles) to the South. Orly primarily serves domestic flights and international destinations in Southern Europe and around the Mediterranean, while Charles de Gaulle is the primary airport for international and long haul flights, as well as many low cost carriers. When planning Paris airport transportation, you should note that both airports are served by taxi, Paris airport shuttle, the Paris Metro, as well as the Air France Bus and the RATP airport bus lines. Any of these different means of transportation can get you to anywhere within the city limits but each differs in cost and how long it will take you to reach your destination. In the event that you arrive in Beauvais via Ryan Air, you will need to use the Coach service operated by Ryan Air (see airport bus, below) or arrange a shuttle or private limousine service. Paris Taxi service from both airports is excellent. Upon arrival follow the signs to "Taxis" after picking up your luggage. You will generally need to wait in line at the taxi stand but lines move quickly (Orly has two different taxi lines, Paris and les Banlieues (the suburbs). Many drivers don't speak English so you may find it useful to have your destination address written on a piece of paper. The name of the nearest Metro stop can also be helpful for finding addresses that are not well known. Finding a taxi to the airport can be more troublesome. Depending on the time of day, it is often impossible to find a taxi in the city, especially on rainy days in the Summer. In order to ensure your timely arrival at the airport, it is best to try to reserve a taxi several hours in advance, as most Paris taxi services will not accept reservations prior to the day of travel. If you are staying in a hotel the reception desk can usually arrange a taxi pickup at the desired time, as they often have special arrangements with taxi services. Travel time to Charles de Gaulle airport from the Center of Paris should take approximately 40 minutes, and travel time to Orly airport is approximately 30 minutes, but travel time can vary and it could up to 50% longer or more depending on the time of day, traffic and your exact location. Beware, Paris taxis start the meter from the moment the taxi driver leaves to pick you up, so when the taxi arrives, the meter will already show more than the minimum charge. Fees vary according to time of day and your point of origin or departure in the city. Since March 1, 2016 taxi drivers are required to charge a fixed rate for trips to and from Orly and Charles de Gauller airports. Drivers are no longer able to charge fees for each piece of luggage, or an airport fee, but the taxi is authorized to charge an additional fee of 4� for each passenger above 4. There is also and additional fee of 4� to call a taxi for immediate departure and 7� for an advance reservation. Verdict: A taxi is probably the most convenient means of Paris airport transportation, but it can often be expensive. Travel to the city is easiest because there are almost always taxis waiting to pick up customers. Travel to the airport is more difficult. At rush hour (morning and afternoon) it is best to call a taxi several hours in advance of your departure time. Although the Metro is often quicker during peak hours, a taxi is much more convenient. Paris Airport Shuttle services are available between the city center and both Charles de Gaulle and Orly. Reservations can be made days, weeks or months in advance, but they must generally be made at least 48 hours in advance. When arriving at the airport you must call a special toll free number (before picking up your baggage) and you will be given a meeting point at your terminal. Once the shuttle arrives it will generally complete its circuit of the terminals to pick up other passengers (as the bus does) then it will drop you off at your final destination in Paris. For departures you will be given a pickup time that will guarantee your arrival at the airport the required amount of time before your departure. Price (inside of Paris city limits) : 22.50€/person for 1 person, 18€/person for 2, 17€/person for 3 or more. Verdict: The Paris airport shuttle is probably the best value for the money for travellers who want convenience for an economical price when choosing a Paris airport transfer. The price is approximately equal to the bus + taxi combination, but once aboard the shuttle no additional waiting and transfers are required (as is the case with the bus or metro). Additional advantages include advance reservation, door to door service, an English speaking driver, a fixed price as well as 24 hour service. Drawbacks include the waiting time for the shuttle upon arrival at the airport (it could be more than the 15 min wait for the bus) and the additional time required to drop off / pick up other passengers. Travelers going to and from the suburbs will need to find other Paris airport transportation, as the airport shuttle only serves points inside the city limits. Charles de Gaulle and Orly airports are both served by the Air France bus, the RATP bus and a Night Bus. Transfer time is approximately 45 minutes depending on traffic conditions. Air France also offers a bus transfer service between Charles de Gaulle airport and Orly airport (details below). When arriving in Paris you must follow the signs in the airport to the bus stop and then purchase a ticket at the stand or from the driver. Once you have arrived at the bus stop in Paris you must still find a way to reach your final destination. That usually means that once the bus drops you off, you will need to take the Metro or a taxi. When going to the airport this process is reversed and you must find transportation from home to the bus stop. Charles de Gaulle: Air France has two bus lines running from Charles de Gaulle airport into Paris. The first line runs every fifteen minutes and has two stops in Paris: Place de l'Etoile and Porte Maillot. 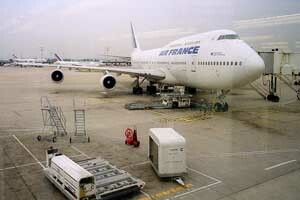 The Air France bus departs from Charles de Gaulle terminal 1 & 2 (i.e. not terminal 3 which is primarily for charters and low-cost carriers like EasyJet) between 5:45AM and 11PM. The second Air France bus line runs every 30 minutes (between 7AM and 9PM) and stops in Paris at Gare de Lyon and Montparnasse. The RATP bus (also called Roissy Bus) departs from all three terminals (including Terminal 3 - where charter flights and low cost airlines generally arrive) every 15 minutes. It arrives in Paris and stops at Place de l'Opéra alongside the American Express office. Service is from 6AM to 10:30PM. The Noctilien Night Bus runs hourly from approximately 00:00 - 5:00AM between Charles de Gaulle airport and Paris. The line 140 stops at airport Terminals 1, 2F and 3 and arrives in Paris at the Gare du Nord and Gare de L'Est train stations, two other lines serve the Paris suburbs. Travel time from the airport to Paris is approximately 50 minutes and the fare is 8.00€ (Navigo Pass zones 1-5 is also accepted). Orly Airport: Both the Air France bus and the RATP bus (Orly Bus) leave from both terminals of Orly for travel into Paris. The Air France bus stops in Paris are adjacent to Metro stations Montparnasse and Invalides. 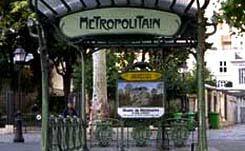 The RATP bus stop is adjacent to Metro station Denfert Rochereau. The Noctilien Night Bus line 131 runs hourly between 00:00 and 04:00AM from Orly Ouest and Orly Sud terminals to four stops in Paris, including Gare d'Austerlitz and Gare de Lyon. The fare is 5.40€ (Navigo Pass zones 1-4 is also accepted). Beauvais: Ryan Air operates a service between Beauvais airport and the 17th arrondissement in Paris. Beauvais airport is about 40 miles from Paris and driving time is approximately one hour. When arriving in Beauvais, follow the signs to the bus, it leaves 20 minutes after flight arrivals. When departing France, you can catch the Ryan Air Coach at "Paris-Beauvais-Shop", 1, boulevard Pershing, close to Metro: Porte Maillot. The bus leaves 2.5 - 3 hours before the scheduled flight time.There is no other scheduled transportation to Beauvais airport, so if you miss the bus you will need to arrange your own transportation. Transfers between airports: Charles de Gaulle airport to Orly airport: Air France operates a bus transfer service between Charles de Gaulle airport and Orly airport. The bus departs from Terminal 1 and Terminals 2A -2F (the same points as the Air France bus to Paris - see below) and it runs every 30 minutes from 5:55AM to 10:30PM. The price is 19.00€ one-way (children 2-11: 9.50€). Verdict: The airport bus service can be a good economical option for the budget minded traveler who has more luggage than can be comfortably carried on the Metro or for those who prefer the additional security and comfort offered by the bus when choosing Paris airport transportation. However, if your destination / point of departure is not in close proximity to one of the bus stops, for those traveling in groups of two or more the bus may turn out to offer small savings or perhaps be just as expensive as a taxi. If you don't have private transportation, in order to get to and from the bus station in Paris, you must take another bus, taxi or Metro. All in all, in order to get to and from the bus station, you should count on an additional fee of up to 20€ if you take a taxi (see details on taxis below), and 1.70€/person to take the bus or Metro inside the city limits. More Information: Air France website, Noctilien website. The RER is the regional rail system that links the suburbs to the Paris Metro. Trains run every 15 minutes (every eight minutes during peak periods) and the trip takes approximately 35-45 minutes. 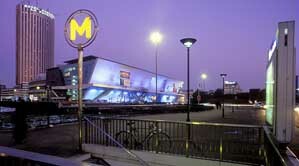 The RER is seamlessly linked to the Metro and they share the same stations inside the Paris city limits. When travelling to Paris from CDG airport, you can take the free airport shuttle train CDGVAL from any airport terminal to either RER station, You can also walk to the RER from Terminals 2 or 3. Once at the terminal buy a ticket that is valid for a ride to the center of Paris (if you have euro coins or a French issued credit card with a smart chip, you can buy a ticket from the ticket machine and skip waiting in line). This ticket is good for a transfer from the RER to the local Metro system and an unlimited number of transfers once you are inside the Metro (as long as you don't exit a metro station). If you know which station is closest to your destination, then you can consult the maps inside the station to find the quickest route. The first RER train departs Airport CDG for Paris at 04:58 and the last train leaves at 23:58. Using the Metro - Going to Charles de Gaulle airport, you must take the Metro to station Gare du Nord and then board the RER line B, direction Roissy/CDG. You will exit at one of the stations: Aéroport Charles de Gaulle 1 or Aéroport Charles de Gaulle 2 - TGV (see above). Sometimes it is not easy to recognize which RER trains go to the airport and which turn off towards another destination once outside the city limits. You must be careful to get on the right train and it is usually prudent to ask somebody at the station which train is the correct one. Once you exit the RER you can use the free CDGVAL shuttle to go to the appropriate terminal. CDG airport is huge, so you'll need to allow sufficient time for this stage of the trip. The first RER train departs the Gare du Nord station for CDG airport at 05:25 and the last train leaves at 23:15. Going to Orly airport is a little bit easier, you simply take the "Orlyval", which connects to the RER at the Chatelet Metro station (duration 32 minutes) and makes two stops directly adjacent to the terminals: Orly Ouest (Orly West) and Orly Sud (Orly South). You'll need to look at your flight itinerary to see which terminal you are leaving from. Trains run from 06:00 - 23:00. Verdict: For those on a tight budget the Metro presents the cheapest means of getting to Charles de Gaulle airport. It can also be the fastest method on some days when traffic is particularly bad. In the case of Orly airport, taking the Metro to the bus station will be slightly cheaper than taking the Orlyval train, but also less convenient. In both cases those unfamiliar with Paris should be very clear about their destination (i.e. name of Metro station or Airport Terminal number) as a mistake could easily double your transportation time. Equally important, passengers taking the Metro should expect to carry their bags through long metro tunnels and from the Metro exit to their final destination. This means that if you have more than a small amount of luggage, you may want to consider other Paris airport transfer options.